A new, free handbook, for journalists reporting climate change in Asia and the Pacific. There are lots of handbooks for journalists on climate change, so why do we need another one? Getting the Message Across, Reporting on Climate Change and Sustainable Development in Asia and the Pacific: A Handbook for Journalists has been customized for journalists to tell the climate change story specific to the region. It explores the essential aspects of climate change, including its injustices to vulnerable communities, especially women and girls and least developed countries, and provides examples of best practices and stories of hope unique to the region. It can be used as a resource for journalists to understand the science of climate change, as well as helping journalists to improve their reporting of the environmental, social, economic, political, technological and other angles of the story. 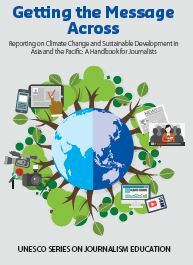 Practicing journalists, student journalists, editors and anyone reporting climate change in the Asia and Pacific will find this handbook an essential addition to their story-telling toolbox. This project is supported by Malaysia Funds in Trust through UNESCO's International Programme for the Development of Communication (IPDC).